motifdeveloper.com Q & A - How can I make a List widget containing toggle buttons as well as text? How can I make a List widget containing toggle buttons as well as text? About the only way to achieve this effect using the stock Motif widget set is to manually create individual toggle buttons and position them beside each row of the list. This would be cumbersome and tricky to work with. 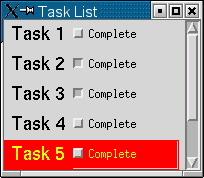 However, the XRT/table widget, available from Sitraka, can easily be configured to function as a "super" list widget, containing toggle buttons as well as textual items. A list is simply a one-column "grid" with some special behavior, which proves to be a simple task for XRT/table. We'll outline the key elements needed to create a table that functions as a list and contains toggle buttons in one column. We have created a second column to contain the toggle buttons (which do not exist yet). Setting the XRT/table XmNxrtTblMode resource to XRTTBL_MODE_LIST causes XRT/table to mimic the behavior of the XmList widget. The other resources refine the behavior of the "list" (specifying multiple selection and non-editable content). Since it is a child of the table, we use the XRT/table XmNxrtTblWidgetLocation constraint resource to specify its location. But here's the interesting part - the value of this resource effectively tells the table to place this widget in all the cells of the second column. How can one widget be located in several places? Through the use of XRT/table's widget cloning feature. When one widget is set to more than one cell, XRT/table automatically creates its own internal copies (clones, if you will) of the widget to fill the rows. Later, we can add callbacks to the toggle buttons to be notified when they are clicked, and then use an XRT/table method call to map the click to a specific cell, but this is beyond the scope of this tip.